The sign of Sagittarius, ruled by the planet Jupiter, is a mutable sign associated with abstract intelligence and higher learning. Sagittarius is a fire sign with a focus on adventure, idealism, and spiritual growth. The emphasis is on learning, exploration, social activities, humor, and an appreciation of the great outdoors. Issues involving higher education, foreign travel, philosophy, and religion become accentuated during the Sagittarius cycle. The house that Sagittarius occupies in the natal chart shows an area of life where one may be preachy, opinionated, tactless, careless, indulgent, argumentative, and arrogant. It also shows the area where one is likely to be enthusiastic, frank, optimistic, congenial, clever, an independent thinker, and an inspirational speaker. 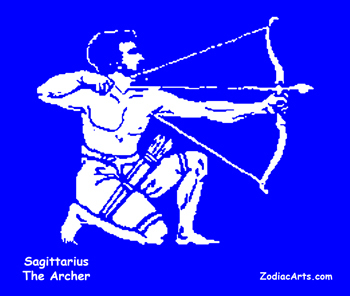 The sign of Sagittarius is associated with the Temperance card in the Tarot. Attune to the qualities of Sagittarius with a 3-minute tarot meditation on Temperance. Temperance is the messenger of a simple spiritual truth – moderation is virtuous. It teaches that one is strengthened by self-restraint. It represents the act of tempering where substances are combined to form a new whole. 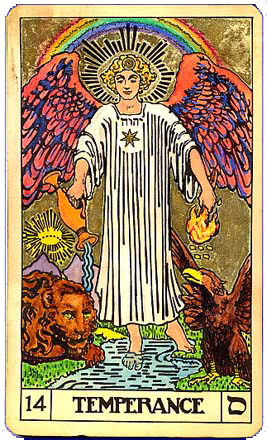 Temperance conditions the quest for higher knowledge, offering concentration, creative energy, flexibility and adaptability as aids to direction. Confer with Temperance to focus on a goal or to journey within to bring self-knowledge to consciousness. Sagittarius Sits in the North by Northwest on the Medicine Wheel. The sign Sagittarius correlates to Strength, the third step on the Western pathway of Sun Bear’s Medicine Wheel. Strength is the ability to firmly maintain a position. The knowledge gained from introspection during the Scorpio cycle will give you the strength to stand in your power.